I started writing this post two years ago. The controversy of the topic spurred me to let it steep. Here are my thoughts on a topic that for some reason is far more controversial than it should be. I’m a huge fan of the vaccination process. Actually, to be clear, that really makes me a huge fan of the rapid adaptation of the human immune system – but I’m glad we’ve figured out how to hack it. That hack, whether discovered thousands of years ago in China or Turkey, or in 1796 in England, is the ability to help the immune system develop resistance to diseases without the host body actually having to suffer the full disease. Pretty cool stuff. Not only is it cool, but it has saved millions of lives. I’m really glad I was given a number of vaccines as a child. My wife and I have had a number given to our children as well. On a seemingly non sequitur note I am also a huge fan of financial investments. Another pretty cool and fairly new concept. I can use capital to purchase land, or ownership of a company and while I go about my day, my investment makes me money. Investing is a good idea, and it has allowed millions of people to grow their net worth. The thing about investments is not all investments are good investments. While many investments lose money over the course of time a lot of those were still good investments, the outcome might just not have been favorable in that case. A truly bad investment is one that does not make mathematic sense ever – one where the risk outweighs the reward from the beginning. I want to highlight an important distinction – the process is not the object. Investing is a good idea, not all investments are good. Similarly, vaccinating is a good idea, not all vaccines are good. Like investments, vaccines come with a risk and potential reward. Like investing, our goal is to find opportunities where potential reward outweighs the risk. The thing I don’t often hear acknowledged from the pro-vaccine camp (or the anti-anti-vaccine camp) is that vaccines do have risk. I’m not talking about the risk of vaccines causing autism, which I do not believe exists, as I have not seen a scientific study demonstrate a statistically significant correlation. I’m talking about other side effects. You can read about them on the CDC website. Most anti-anti-vaxers use the autism argument as a straw man that they attack, without addressing the very real risks that exist. An example of this is a video Penn & Teller made. Some of the risks of vaccines are minor like rashes and fevers. Some of them are severe like seizures, permanent brain damage and death. Those are real risks, documented by the CDC. These are risks that you take on when you inject a foreign substance into your body or the body of your children. Some vaccines are riskier than others. In fact, some are so risky they never leave the lab or complete the FDA review process. Others are released to the market and later replaced or updated upon further research. In 1999 the CDC found that the particular rotavirus vaccine that they had previously recommended had statistically significant negative affects and withdrew their recommendation. Additionally, any time you manufacture an artifical substance in bulk, there is risk of error. That is why things get recalled. There is an error making the drug ineffective, harmful or deadly. You can check out the FDA’s info on past recalls. All of this is to make clear one point. Vaccines do in fact have a nontrivial risk. Thankfully, you don’t have to navigate that risk alone. We have doctors to help educate us about vaccines and coach us through the process and we have recommendations at the global, national and state level about what you should do. It is important to realize, however, that the larger the organization, the more broad their perspective and therefore the less specialized it can be. Thinking back to our investment metaphor – there is no one size fits all set of best practices. Different individuals have different goals, risk propensities and exposures that must be taken into account when deicing on a course of action that is best for them. There are certainly some common principles which often ring true – but that does not eliminate the need for personalization. National policy deals with a scale that is much different than your own and thus can not be very personalized. To blindly trust it is to ignore many of the things that make you unique. The great news about the micro-level is you know a lot more about what makes you unique and can react to that information to create a more tailored and appropriate course of action. Some people are allergic to medicine that commonly cures patients without a side effect. Penicillin is one that you might know about – it can help fight bacteria in the bodies of certain people but for others that are allergic it can be deadly. This is just one example – there are thousands of substances to which people can have allergic reactions (some people are even allergic to water!). It would be impossible to recommend a single course of action that was appropriate for all people in terms of medicine. Thinking about vaccines again, some people are more sensitive to certain side effects and some people are less sensitive to picking up diseases. These things change their risk-to-reward equation and thus could alter what the best course of action for them was. Similarly, differences in behaviors and lifestyles affect the advice that is best for us. A family that frequently travelled to communities around the world has a different risk exposure than a single man living in a cabin deep in the woods by himself. The courses of actions should be as different as they need to be to ensure we are meeting our goal of finding opportunities where potential reward outweighs the risk. Your medical advisors can help you determine a path that is best for you based on those personal needs. The problem is, doctors aren’t perfect. There is a reason malpractice lawsuits exist. Sometimes, despite generally good intentions, doctors act in neglect or error. While this doesn’t make you a medical expert, it does mean you need to be responsible. An individual that does not react well to a specific drug or chemical should be as vigilant as someone with a gluten allergy is when ordering off of a new menu. Blind trust is foolish – you have a responsibility. Now, the last few paragraphs might seem to be defending an anti-vax position, so lest I mislead you in my true intent, let me present another case of foolish blind trust. A community in Texas once blindly followed medical advice from a pastor to avoid vaccinations. After a family contracted a case of measles on an international trip it spread through the unvaccinated community, eventually causing the church to reverse its position and allegedly host a vaccination clinic on campus. If you have followed any of the debates between the polarizing groups of pro-vax and anti-vax communities, you might think the decision you have is binary. It is very important to understand that is not true. Any individual (depending on the legality where they live) may chose to utilize all of the CDC recommended vaccines, some of them or none of them. You can actually go above and beyond if you have access to additional vaccine options. You can also chose to modify various aspects of it like timing, method, drug producer, etc. One of the most modified areas, behind opting-out of certain vaccines, is to follow the CDC schedule but modify the timing based on a discussion with your medical professional. This is something Dr. Sears has been a proponent of for a long time. You can chose to do that… for now. The problem is some people want to make it illegal to skip vaccines. They want to remove the ability for an individual to make decisions at a family level based on their personal needs. I understand where they are coming from. They want to protect themselves and those around them. The problem I have is that they want to do this at the cost of individual freedom – this isn’t something to take lightly. The way the US government works, once something is deemed part of what the government controls, it is very hard to later take that power away. It takes a lot of effort to do so where there is often no impetus. That power also makes the issue more vulnerable to lobbying and mass opinion without giving individuals a chance to opt out – whether for personal reasons or due to their individual circumstances. Take flame retardants for example. Government policy mandated that mattresses passes certain tests (thanks in large part to lobbying by the chemical industry) which results in manufacturers using a compound called PBDEs as a flame retardant (made by said chemical industry). Thirty years later in 2006 the State of California banned PBDEs due to health concerns. Years before that, there were individuals that felt PBDEs weren’t safe yet they had little choice due to what was on the market, thanks in large part to government policy. It took the average consumer 30 years to realize they’d been sleeping on top of a harmful chemical. Even now, when scientific consensus seems to indicate that PBDEs are harmful to humans, they are not banned everywhere. By making the issue a part of policy, the pace of change was decreased, and thus more people suffered negative effects than would have if the issue had only been a non-enforced recommendation. Also, of particular note here is the fact that there were companies that profited off of the policy not changing. Chemical producers that lobby for their chemicals to not only be allowed, but become essentially mandatory. Our government policy can be influenced from individuals that seek profit over the common good, which is why it enforcing policy is such a consequential decision. What might seem like a beneficial policy today can create the power that will later manipulated to enforce something harmful. Specifically, whatever policy you are ok enforcing on the bodies of other people, there is a group out there that is ok enforcing a policy you disagree with on yours. If you give the power to do so to the government, it is only a matter of time before that group has control of the government and use that power against you. These directly follow my three points above. 1) Educate yourself about risks associated with your actions. 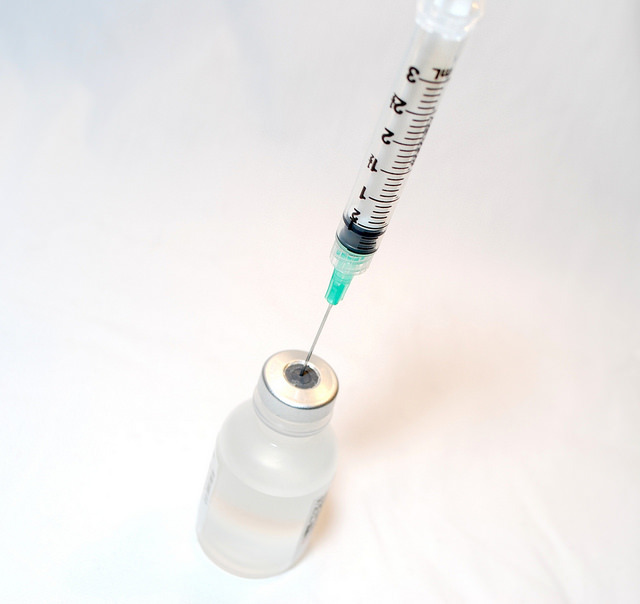 Before injecting or not-injecting something into your body or your child’s body (or investing your money, or just about anything else you could do) take some time to figure out what it is you are doing. You are making a big decisions and to do so without any research is foolish. 2) Please do not blindly trust anyone with medical advice. This includes your doctor, your pharmacist, your government, your pastor, your hippy friend Luna, some celebrity activist or an article on a really great website. Exposing yourself to diversity in opinion and thinking rationally about the topic helps increase your chances of taking the most appropriate course of action. 3) Please think very seriously about giving the government control to enforce policy on your body and the bodies of those around you. Once you give personal freedom away it is very hard to ever take it back.